Brewing Company: Weyerbacher Brewing Co. 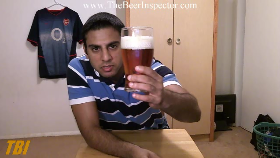 I finally decided to review a beer from the oldest brewery in America. 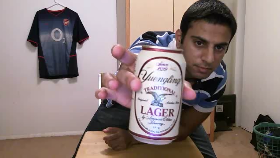 Yuengling Traditional Lager is Yuengling Brewery’s flagship beer that is distributed to 14 states on the east coast. They include the following: Pennsylvania, New Jersey, New York, Delaware, Maryland, Washington D.C., West Virginia, Virginia, Tennessee, North Carolina, South Carolina, Georgia, Florida, and Alabama. They soon plan to distribute to Ohio as early as October of this year. Supposedly, this is President Obama's favorite brew. Who knew? Out of a can, this beer poured a rich copper color into my Guinness pint glass. The carbonation on this one was very apparent. The head was light brown with a one and half finger length, which dissipated fairly quickly. For the most part, the aroma wasn't really overwhelming. You got hints of caramel and toffee with an underlying grassy hop. For 4.4% abv., my olfactory system sure got more than it expected. The taste wasn't complex, but it did have more to offer than your regular American lager. I experienced sweet malt in the front and middle. In the back end, I was hit with this lemony/salty flavor that surprisingly wasn't off putting. This was light to medium body with a thin watery texture. Carbonation feel was soft that went well with the lemony finish. All in all, this was a pretty decent beer. For around six dollars a six pack, you really can do worse. I definitely see myself buying a 6-12 pack of this and watching a sporting event or busting it out for a tailgate. Football season will be just around the corner, so pick yourself up a case! Brewing Company: Miller Brewing Co.
Today, I'm doing a beer request for a buddy of mine in California. 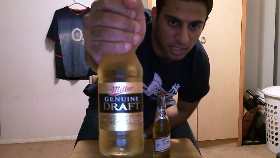 He wanted me to review Miller Genuine Draft(MGD), so I figured it would be fun to do a side by side review of MGD and Miller High Life. It seems as if both beers are made from the same recipe. Their nutritional values are identical, so what makes these beers different? Well, Miller High Life goes through a pasteurization process, whereas MGD doesn't. MGD is an unpasteurized beer that is actually cold filtered. Basically, cold filtering is a process where you chill the beer to a certain temperature. In effect, the impurities are clumped up together making it easier to filter out. Miller High Life was introduced in 1903, making it one of the oldest brews from Miller Brewing Company. MGD was introduced in 1985. For the most part, both beers had a similar look. 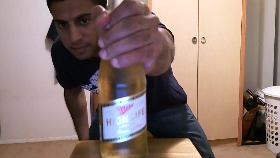 Miller High Life had a three fingered, white head that looked creamy. MGD had a one fingered, white head that looked pillowy. The Miller High Life had a gold clear body which was accompanied by moderate carbonation. The body on MGD was similar, but the golden color appeared a bit faded out. There was a dramatic difference in the smell between these two beers. The Miller High Life had aromas of light grain and heavy corn. Overall, the High Life had a very processed smell. To my surprise, the MGD was very weak in the aroma department. My nose picked up a little of grain and sweet corn, but that was about it. The potency of the smell was more closer to a light lager than a American adjunct lager. I'm glad I did this side by side comparison because I would've never guessed that there was a overwhelming difference between these two beers. In the front and middle, the Miller High Life left a sweet malt taste with a little corn flavor. Almost no flavor in the back end. The carbonation was just right which was complimented with a watery and creamy texture. For an American Adjunct Lager, High Life hit the spot. On the other hand, the MGD was quite a disappointment. There was little taste to this beer. Just like smell, MGD had a mild grain and corn taste. The drinkability of MGD was ruined by its fizzy carbonation. 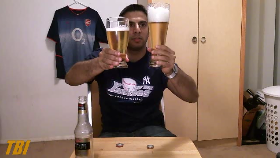 Both are light bodied, but MGD was just too fizzy for me to enjoy. In my opinion, Miller High Life is light years ahead of MGD. MGD was just not a drinkable beer for me. It lacked flavor and the mouth feel was atrocious. At my local liquor store, MGD is actually a dollar more for a six pack. This will probably be the last bottle of MGD I'll be drinking in my life. Miller High Life on the other hand reassured me that it's still my go to American adjunct lager.